If you want to avoid looking basic in the same LBD as everyone else at the party go for purple V-neck dresses. 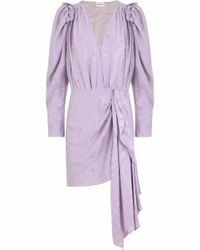 Much more interesting than a monochrome look and less obvious than a classic red, these purple pieces reveal just the right amount of skin thanks to the deep cut neckline. Zac Posen, Issa and Calvin Klein make some of the best. "lilac Leopard Print V Neck Midi Dress"